Sammy hope you make a smaller version of the note before another company beats you to it. 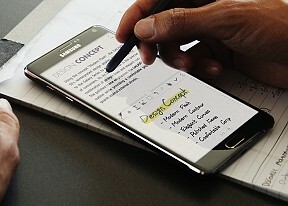 Would love if my S5 had a stylus just for the odd occasion when it would be handy. Which model of those two should be better for watching fhd movie's, internet browsing, heavy multitasking, photography and video shooting. It shouldn't drayn battery quickly is important too. TouchWiz must run without slowness. Exynos or Snapdragon? Which model of those two should be better for watching fhd movie's, internet browsing, heavy multitasking, photography and video shooting. It shouldn't drayn battery quickly is important too. Exynos or Snapdragon? Seriously? Your were that tiny? I mean your brain..its all wrong., this is the greatest camera on smartphone we talking about, that taking highest MP with wider shot, taking HD with 120fps..
Want to upgrade from an old blackberry device! Thinking of getting an iphone 6, a note 4 or a passport??? Don't know the one to go for?? Am confused! I want the iphone 6,cos of the face time stuff,the smooth OS,Their quality apps,games etc but what turns me off is that its too fragile,A single drop and everything is over!!! And again,Getting songs on it is a big task!!! Will love the passport(u knw am presently on an old bb device) but the phone application issues,APPS from Amazon not connecting with the BB Hub,Not all android apppps on it and those on it are not enough quality!Too big and awkward!! These 3phones has @least 1 feature I love to have but I can't have the 3@a time, Have read so many reviews and watched so many videos but am still confused!!! jib, 31 Oct 2014Can anyone tell me that note-4 has finger print unlocking facility? Oh yes it does have finger print unlock.Just like the one on Galaxy S5! jib, 31 Oct 2014Can anyone tell me that note-4 has finger print unlocking facility? Yes. If you have read the review, you would have known. Can anyone tell me that note-4 has finger print unlocking facility? Anonymous, 30 Oct 2014Can someone honestly test the handwriting recognition and comment. I am mostly interested in t... moreIt works great with One Note. Microsoft has even built in support for the stylus. Can someone honestly test the handwriting recognition and comment. I am mostly interested in this phone for productivity purposes, has anyone tested it with the OneNote app ?. Does the app support the stylus ? Have been patiently waiting for a good Windows stylus phone that will support OneNote to be released but can't see anything on the horizon. Might have to opt for this as mostly positive reviews. Can any one confirm the following: My Note 4 isnt allowing 3rd party files viewers programes to alter files and folders saying its an Android 4.4 problem! Next time round Sammy try to make it also water/dust proof, although I won`t experiment with that after spending A LOT of money, but its a good thing to have just in case. I`m still suspicious on the battery life and time for charging, as these leave much to be desired for both my S4 and Tab S 10.5. They drain quickly especially if you`re on full brightness and either playing games or running videos on youtube, plus they take forever to charge back to full. So I`m hoping that this time round its different. Having said that, Samsung Note4 is one of the best phablets out there at the moment. I admit I side Android, but let`s face it Apple/IOS, you`re just not fully customisable, you copied many features, only recently (at last!) got bigger screens...but bendable/breakable, and that`s that. Why is it being sold with Exynos processor in India, where as rest of the countries get Qualcomm Snapdragon. If you are buying this phone in India, its a big no no.. I'm thinking of upgrading from Lg G3 to Note 4, any suggestions? I got tired of the lagging interface while browsing or playing games in the G3. The restarting/freezing problems and also the heating up really sealed the deal for me. You mean that the speaker audio quality is bad? Because this phone has a very good audio chip.